The Tennessee Volunteers were the sheik pick by many to win the SEC East. They have a ton of young talent and they finished strong. The Vols also had a ton of pieces coming back this season and added some more young talents to their stables. The future was looking bright. And while some rode the expectations this season, others thought it was next year that they would be ready to win and not this season. Well, the Vols now sit at 2-2 after losing a game at Florida this past weekend. They played hard and made some plays, but they simply did not get the job done. The loss to the Gators makes it eleven straight the Volunteers have lost to the Gators. And what makes it more interesting is this was probably one of the best shots they had to beat them. They returned everyone to the team essentially and Florida was playing a redshirt freshman quarterback along with having one of their starting cornerbacks out for the game. The game was right there for the taking and yet they seemed to let it slip through their grasp. Within all this, there have been questions about the team and where they are. But even more than questioning the players, some have begun to question the coaching that’s happening. 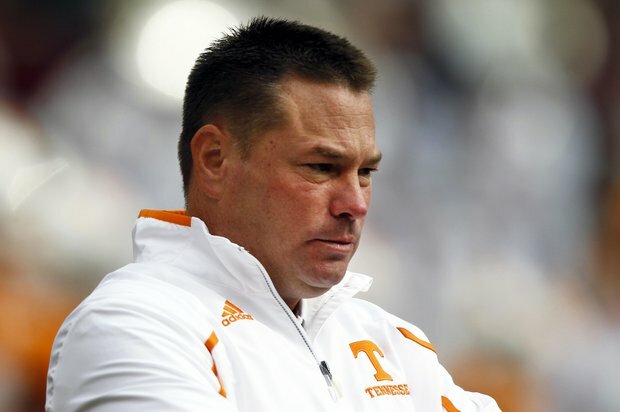 Butch Jones took on the Tennessee job three years ago with a mess on his hands. The team was devoid of talent and looked to get back to relevancy. Each year the team has gotten better under him as they have now got some expectations on them. And with that, there was some thought that they would beat Oklahoma and Florida. And in both games, the Vols held a double-digit lead late in the game. Against Oklahoma, the Vols were up 17-3 in the fourth quarter. And against Florida, the Vols were up 27-14 halfway through the fourth quarter. It seemed as if they had that one won. But an inexplicable timeout, a conservative gameplan with a lead and poor execution caused the Vols to flounder when playing with the lead. The same thing happened two weeks previously with the team against the Oklahoma Sooners. And here we sit, looking at a team that ripped defeat from the jaws of victory twice in a season. The players make the plays on the field and are the ones who play the game, but the coaches are an intricate part of the college game. They usually are in control of all things that happen and put players in position to make it happen. It seemed like every single time whether it is this past game or the Oklahoma game, the Vols and their coaching staff would call runs with the lead like they either did not trust their quarterback or thought they could salt the game away. Well, in each time doing so, they essentially slowed down their own offense every single time. But this flounder is not just limited to the offensive coaches. The defense seemed to let off the gas a little bit in both games. The Vols have not gotten to the quarterback like they did last season, but it seemed like the pressure they were trying to bring dissipated and the coverage was looser. That allowed opposing offenses to get wherever they wanted to and gain momentum to eventually catch up to and dispose of the Vols. So after seeing these late-game flounders, what can the Vols do going forward? Well, it’s always said that you cannot play scared. That saying can apply to coaching as well. Butch Jones and crew looked like they were coaching not to lose instead of coaching to win when they came down the stretch in both games. It’s understandable that you don’t want to give the opposing team a chance to win, but what about when it comes at the cost of your own team? Each time it seems the Vols coaching staff and their handling of their team has stunted the momentum they had gained. The Vols are a good running football team, but there is no way that they should have abandoned the pass down the stretch. At that point, the defense knew what they were doing and where to find them. And if that is the case, it makes it easy on them. And defensively, when you play prevent defense, that is preventing a win, especially when you play it way too early. Another thing Butch and his staff may want to do is take the cuffs off some of these kids. There are plenty of players with tremendous talent on this Tennessee team, but you would not know it because of the doldrums they go through when closing out games. When you have a lead like they have, that is no time to let off the gas. That is actually the time to let your playmakers bury the opponent. If you aren’t going to let them be the playmakers you recruited, then why even have these kid there to put the nail in the coffin? The Vols are a very talented team and they are just waiting to explode. It’s time for the staff to allow them to. Butch Jones is not on the hot seat right now, but there are plenty of Tennessee fans that are not happy with the losses to Oklahoma and Florida. He has recruited some very good talent to Tennessee. Now it’s time to turn them loose and quit the conservative coaching. This team should be undefeated right now, but the scared mentality never helped a coach win any ballgame. And Butch Jones has shown that twice this season. The AFC North is always a very tough division. The Cleveland Browns, Baltimore Ravens, Cincinnati Bengals and Pittsburgh Steelers make up this division and every game between any of them physical. This season is no different as the division games so far have been physical battles. Taking a look at the standings so far, the Cincinnati Bengals lead the division, followed by the Pittsburgh Steelers, Cleveland Browns and then the lowly Baltimore Ravens at 0-3. Cincinnati has looked very impressive to start the season. And with Pittsburgh losing Ben Roethlisberger out four to six weeks, the chances the Bengals have to win the division and make the playoffs went up significantly. But with the Bengals, making the playoffs have never been the issue. The team always seems to make it happen when it comes to the regular season. And with their defense, they always seem to come to play in the postseason as well. But with this team, the quarterback and the head coach seem to be in the same malaise. Both have had pretty good success in the regular season. But both have struggled when it matters most. 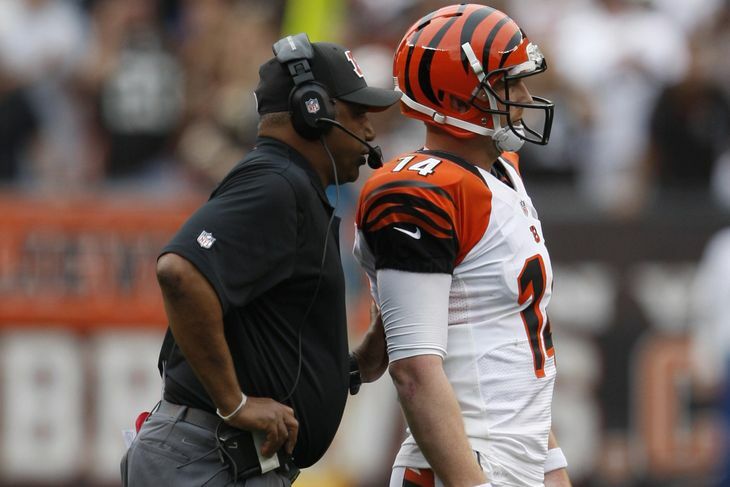 Quarterback Andy Dalton has been running the Bengals offense ever since he was a rookie. And year after year, he has put up average to a little above average numbers. For his career, the 5th year quarterback has thrown 107 touchdowns to 67 interceptions. He has had some games where he seems to be in a zone. And he has had others that make you scratch your head. But he always seems to find himself playing in the playoffs. Whether some like it or not, he has got the job done as far as Cincinnati’s concerned and helped them make the playoffs. But once he’s gotten there, that’s when he has floundered. He has thrown only one touchdown pass in the playoffs in his four appearances. And with that, he has thrown six interceptions. His quarterback rating when he has been there has not been over 70 once. He just has not made it happen when it matters the most. But even with those numbers in the postseason, the Bengals decided to pay him and pay him well last season (signed a six-year, $115 million contract extension last offseason). With this new contract now comes expectations. And the prevailing thought is that Dalton needs to win a playoff game and win one now. Because the contract he was rewarded with comes with great things expected. And if those aren’t achieved, he could find himself on his way out of Cincinnati. Dalton is feeling the pressure, but head coach Marvin Lewis should be feeling more pressure than Dalton. Many times people have wondered how he has kept his job as head coach of the Bengals. He took over the Bengals when Chad Johnson was the star wide receiver there and has been making the Bengals a household name when it comes to the playoffs ever since. But along with starting to become a consistent team in the playoffs came a different set of expectations. Gone were the days of making the playoffs being a goal and in came the realization that winning a playoff game has to happen. Ever year the Bengals have made the playoffs, Lewis and his team has just not been able to get it done. Each season it seems like the team gets it going through the regular season and flounders when it matters the most. Fair of unfair, the failures in the playoffs fall on one man and one man alone: Marvin Lewis. Something has to be happening as to where he cannot come through in the playoffs. Marvin cannot continue to keep making the playoffs and lose. It has happened a lot over the years and eventually the management will get tired of it. If they continue to keep Lewis and let him keep taking the same pattern, then that says more about the organization than the team at that point. And ownership may want to question themselves. Lewis and Dalton are the two key ingredients in trying to get the Bengals to the next level and a playoff win. The success lies within both of them. Lewis has to find a way to get the best out of his team in the playoffs. And as for Dalton, he has to get it together in the playoffs as well. Both have been missing in action in the playoffs and it’s time for them both to appear. Their jobs could very well depend on how well they do. The Bengals will more than likely make the playoffs again, but that is far from the goal and should be far from the expectation for this team. The NFC had a few teams that were looked at as Super Bowl contenders. The Green Bay Packers were on team that was talked about. After a 2-0 start to the season, they are living up to the feelings a lot of fans had about them despite losing wide receiver Jordy Nelson in the preseason. 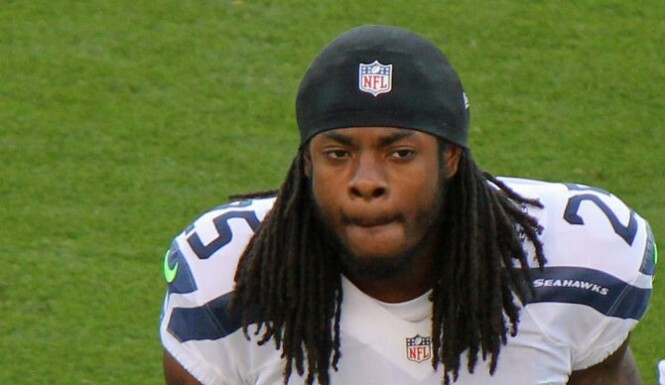 Another team that received a lot of attention before the season is the Seattle Seahawks. The team started off the season losing two straight, but they dominated the Chicago Bears on Sunday 26-0 to let folks know that they are still a team that needs to be feared. These two teams have pretty much been the two that many believe will represent the NFC. But there is one team that many fans continue to sleep on. And believe it or not, they are for real. And contrary to belief, this team has as good a shot as any to represent the NFC in the Super Bowl. The Arizona Cardinals have gotten better and better each year under head coach Bruce Arians. The veteran offensive coordinator took over a talented team that needed some direction. And once he stepped in, he provided the direction they needed. He has had them at double-figures in wins each year he has been there, making a playoff appearance the last two seasons. But this year, this team may be the best it has ever been under him. Last season, the Cardinals had the best record in the NFL while Carson Palmer was at quarterback. Things seemed to be lining up for them perfectly when Palmer went down with a knee injury against the St. Louis Rams. The way he landed led many to believe that it was an ACL injury and it was confirmed when tests were done on his knee. Drew Stanton took over at quarterback, but this team was not the same going forward. They were missing their leader and their best quarterback. This year for them, hopefully he stays healthy. With him healthy, they will definitely build on their success last year. And with him, the young receivers that they have (Michael Floyd and John Brown) are better. The team hopes that Palmer stays healthy because he is key to their Super Bowl run, but he is not the only offensive ingredient that is needed to make this run happen. The Cardinals, for all their success last season, were a terrible running team. The group of backs they had last year were just not getting the job done. And going into the offseason, there were still questions in regards to what they would do to improve the running game. Well, they went out and got offensive guard Mike Iupati and running back Chris Johnson this offseason to try to boost their running game. Iupati has not played and Johnson had a big game today but has not taken over as the everydown guy, but even with that they are still a better running team. It seems like the mindset of the team has changed offensively. The team last season just did not seem to be very physical when running the ball last year. This year, the team definitely has a physical presence in the trenches. And it seems like their running backs got the memo as well. The Cardinals are ranked 12th rushing the football so far this season, averaging 117.5 rushing yards per game and 4.4 per attempt rushing. Last season, they only averaged 81.8 rushing yards per game and averaged 3.3 yards per game. The addition of a consistent running game makes the Cardinals even more dangerous when on offense because now they can have some true play-action offense that opposing defenses will respect. And with Larry Fitzgerald having a great season so far, that offense has become scary good with a running game (averaging 39.5 points per game so far this season). The offense in Arizona is scary, but the defense is as well. Last season, the defense was manned by defensive coordinator Todd Bowles last season. And with his constant pressure and blitzing style, the Cardinals were a feared defensive group. They boasted a defense that was ranked in the Top 5 in the NFL. Bowles and his defense were so good last year that it landed him a head coaching gig with the New York Jets. With Bowles leaving, some questioned whether they would be able to sustain what he created or fall back in the crowd. The Cardinals promoted outside linebackers coach James Bettner to defensive coordinator and by all indications so far, the Cardinals have not dropped off at all. So far, they are ranked in the Top 5 again this season. But what is different this year is the level of playmakers they have in the secondary. 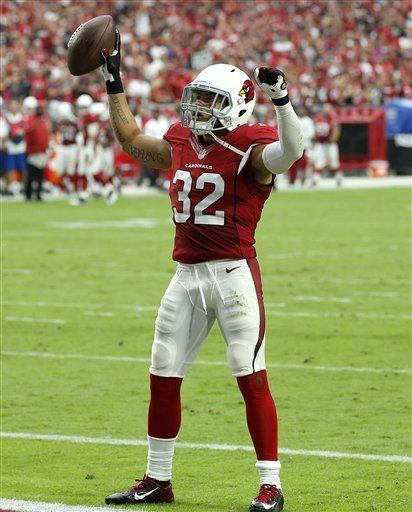 Safety Tyrann Mathieu, for example, has been excellent so far this season and continues to get better. The thought is out there that he is becoming one of the best playmakers the Cardinals have, rivaling cornerback Patrick Peterson. And with the pass rush they have, led by defensive lineman Calais Campbell, it allows the playmakers on the back end to make plays. As the season goes on, the team will be even more exciting and we will get to know all the playmakers they have in their secondary to accompany their front seven. The Cardinals once again have everyone where they want them. No one is talking about them at all and yet they are atop the NFL standings at this point with three wins and zero losses. But as time goes by, they will receive the attention they deserve. And what many will realize is this team is better suited than their 2014 team to make a run at a Super Bowl. The Seahawks have had a rough start to the season. They went to St. Louis and lost to the Rams in overtime when many expected them to win. And this past Sunday, they lost to the Green Bay Packers on the road. The team had not seen a 0-2 start in a long time and there were some concerns about the team. The offensive line will continue to be a concern for the team due to them not jelling so far and the issue of them blowing assignments. But the biggest concern many have when looking at the team is their secondary. Before this year, the Legion Of Boom secondary were feared. They had a ball-hawking safety in Earl Thomas, a cornerback that makes plays in Richard Sherman and a unique safety that leads them in Kam Chancellor. But going into this season, the leader of that secondary was not present. Chancellor, who has three years left on his deal, wanted some of the money at the end of his deal brought forward. The Seattle organization did not meet his desire for that to happen and the two sides both sat at a stalemate until Chancellor came back to the team this week. Citing a pact made with Seattle running back Marshawn Lynch, Chancellor is back with the team and back to help his teammates. Many feel as if his holdout was counterproductive to the team and it was in poor taste. In many of these situations, fans of the game view players as being greedy or selfish. And there are even some that wonder what the players think. But what about the player that is actually holding out? What are the thoughts that he has? There is always a delicate balance between team and self. The team is what many love to be a part of. The players, the comradery and the fun that happens during a season is something that is special. And in Seattle, the vibe there is on that seems to be great among all of them. Chancellor ended up coming in because he wanted to be there with his teammates and help get this thing right. And ultimately, the team is what makes him his money. Without the players that surround him, Chancellor would not be the player that he is. It can arguably be said that he left them high and dry by going for his money. And in the end, it was truly a no-win situation for him. He was not going to get that money moved up by Seattle and they were solid in their choice. And with the money he lost in this deal, it will be interesting to see if they waive the fines he incurred or he has to pay them. Paying them will further strain the relationship between Chancellor and the team. But going back to the team, it would seem that he put himself before the team and for that, some believe he is a selfish player. The selfish nature of sports is something that eats at fans but never seems to bother the players as much. Very rarely do you hear of players getting mad at players getting their money. In fact, many encourage them to do so. So the selfishness that many fans feel as a fan of a team is falling on deaf ears when it comes to the players. The so-called selfish move by Chancellor is one that he created. After all, he signed the deal. But the reality that all are forgetting is that the owners can cut a player from a deal he signed just like the player can want to renegotiate. The result can be a player missing out on guaranteed money that both sides agreed to. And in that instance, the owners can be just as guilty of not owning up to a deal just as fans speak of players not owning up to them. Because of this aspect, this is why players hold out for money or want restructured contracts or extensions. They put themselves in harm’s way each time they step on the field and that leads to some players having shorter careers than they expected. So in some instances, you have to be selfish. The team will be there, but will they be there when you are injured or done playing? The answer in most instances is no. Kam Chancellor did sign a deal that has three years left on it. And it is true that he agreed to the deal just like the owners did. But unlike other professional sports, contracts are not guaranteed in the NFL. And because of that, there are some time where you have to be selfish. It may not seem right to those that view the team, but ultimately you have to take care of yourself. If within those three years, Chancellor’s playing level drops, the Seahawks could approach him with a salary restructure for less money or could cut him altogether is he decides against a restructure. So in taking a stand for a new contract, Chancellor was trying to get the money at the end of his deal moved up so he was certain to get it, instead of playing the waiting game and potentially missing it. His gamble failed, but that was the gameplan. Chancellor has said that he will address this situation this offseason. It was clear the team needed him and with him back in the fold, the Seattle defense will be a little scarier than they were before. But aside from the team, the balance between being selfish and being about the team is something that will not end with Kam Chancellor. It would end if there were guaranteed contracts in the NFL, but that won’t be happening anytime soon. So going forward, expect more holdouts and things like that coming from players. And fans, understand that sometimes the players have to be selfish. They could be getting paid one week and looking for employment the next. That is the nature of the beast that is the NFL. They have to get it while the getting is good. The Indianapolis Colts were a team many picked to be in the Super Bowl this season. With the additions of wide receiver Andre Johnson and running back Frank Gore, many felt Andrew Luck had the weapons he needed to make it happen. So when the season began, it was expected that the offense would be the best thing going for Indy. Well, that plan to have that explosive offense has not gone as some thought. The Colts offense has been very uninspiring in their execution. Plenty of things are going wrong that have led to the results they have got so far. The offensive line is not solid and that has not allowed Frank Gore to get on track. And even when Frank Fore has got some good runs, it usually results in a holding play. As far as TY Hilton, he has been small in his effect on the game so far this year. He suffered an injury in the first game and had a highlight play against Jets defensive back Derrelle Revis, but he has not been the guy people expected him to be. If there has been one bright spot for the Colts offense it has been wide receiver Donte Moncrief. He has been effective when given his chances.But even through all the issues the Colts are having offensively, the big connector to all of them is their star quarterback: Andrew Luck. When Andrew Luck was selected, there was the feeling the Colts were getting the next great quarterback in the NFL. And along with that, there were things that people looked past while anointing him the next great quarterback. For example, Luck has been pretty careless with the football for stretches. Take a look at the playoff game against the Chiefs in the 2013 postseason. Luck had three interceptions that game and helped that team dig a huge hole for themselves. He eventually dug himself out of that hole, but that does not change the fact that he was careless with the football. And starting this season, it seems as if he has not valued the football at all. He has 3 touchdown passes on the season, but he also has five interceptions. And on those interceptions, it seems like he is trying to force things rather than take what is given to him. The result of him trying to force the football has landed him with the worst quarterback rating of his young career. But looking around the league, the benefit of the doubt has been given to him a lot. In fact, plenty want to blame the offensive line for what all he has done so far. But in the case of some of his contemporaries, it seems the opposite treatment happens. For example, Carolina Panthers quarterback Cam Newton has been a constant lightning rod for criticism because some feel he has not lived up to expectations. But if you take a look at what he has, he is doing excellent with what has been given him, especially the last two seasons. His offensive line has been a hodgepodge of players that were picked up off practice squads or afterthoughts to make the team, his running backs have been largely underachieving and besides Steve Smith, not one wide receiver he has had scares anyone. Yet he takes what he has and he makes that team go. Cam is just one of a few examples of players that get raked over the coals for their bad play. If he was the one in Andrew Luck’s shoes, there would be harsh criticism out there. But somehow Luck continues to avoid the criticism that he so justly deserves so far this season. The fact of the matter is he is playing bad football. It has nothing to do with the offensive line. The real truth is they have been shaky since he got there but he still succeeded. If you take a look at his career, he has taken a ton of hits but he has also made a ton of good throws while being hit. But this season, he has made some bad throws in those same situations. His struggles also have nothing to do with Andre Johnson and TY Hilton. They are getting open but just not getting the football. Offensively, this has everything to do with how Luck is playing. He is not playing like the best young quarterback in the NFL. He is playing like a quarterback trying to do too much. For him going forward, he has to relax, play the game and continue to take what the defense is giving him. If he continues to play as he is playing now, then the team will continue to go in the downward spiral that they are in now. Frank Gore, who came to play with Indianapolis because of Luck, thought he was coming to play with an elite quarterback. But right now, Luck is not playing better than the quarterback Gore left in San Francisco, Colin Kaepernick. And if you take a look at statistics and the games he has played this year, Luck is among the worst quarterbacks in the NFL through two games. Luck has 14 games to get it together and he more than likely will. We all know what he is capable of by looking at his numbers. But the overall lesson that can be taught in looking at Luck is that many crowned him too quickly. Let him earn his stripes to be the best young quarterback in the NFL. Because right now, it is not clear that he is the best young quarterback in the NFL. There is one in the Northwest that can definitely give him a run for his money on that one. And his name is Russell Wilson. This Sunday is a big game for Luck and crew when they come to Tennessee this weekend. Marcus Mariota and the Titans will be fired up. They see a Colts team that is playing bad and want to take advantage of them. This is where leaders step up and lead their teams. Will Luck step up and lead them or will he continue the downward spiral? We will have to find out on Sunday. But as it currently stands, this disaster on offense rides on the shoulders of Andrew Luck. And it is up to him to dig them out of this hole offensively. When tough situations happen, that’s when great quarterbacks and leaders step up and make it happen. The next challenge has now arrived Mr. Luck. Are you ready to accept? The exciting second week had some great games filled with excitement and good finishes. And unfortunately it also had some games that left us wishing we wouldn’t have wasted those three hours watching. Within those games, there were some performances that were excellent and there were others that left a lot to be desired. And there were even some that made some things happen that many did not expect. You can always expect something interesting to happen in each week of the NFL. With that being said, here are the General Proclamations for Week Three in the NFL. Washington wide receiver Pierre Garcon will go over 100 yards and at least one touchdown in this game. The Giants were torched last week versus supremely talented wide receiver Julio Jones. Garcon is not as talented as Jones, but he is essentially the only wide receiver that can threaten the Giants. And because of that, he will make some things happen despite all the attention on him. New York running back Shane Vereen will have a touchdown running and receiving in this game. The former Patriots running back is very good in the passing game and he seems to be getting more chances to be involved in the running game. Matching him up against the Redskins linebacker corps is going to have him licking his chops at the prospects. Washington quarterback Kirk Cousins will have three interceptions in this game. The line last week for him may have shown you that he had a good game, but he essentially got lucky he did not get intercepted more than he did. Well this week, the Giants will get their hands on a few of those errant throws and reel them in. Just a matter of “if” and not “when” in the case of Cousins. Atlanta wide receiver Julio Jones will have a fun time in Dallas. And that fun will include visiting the endzone twice and having over 150 yards of receiving. The man is on a mission and I don’t think the Dallas secondary will have anything for him. Dallas quarterback Brandon Weeden will show us all why he was let go in Cleveland. He will throw two interceptions this week and may even add a fumble to this one as well. The Cowboys will try to simplify the offense for him, but the thing is he has no solid running game to depend on. And that will hurt him in the end. The Atlanta Falcons will score at least one defensive touchdown. Weeden will give them a few chances to make that happen and eventually one of those chances will turn into six points. Indianapolis quarterback Andrew Luck will throw at least one interception. It’s starting to get alarming that he throws interceptions as much as he does these days. And if I am a Colts fan, I have to be somewhat concerned if this pattern keeps up in Game 3 of the season. Tennessee quarterback Marcus Mariota will take a look at the tape out there on the Colts defense and go to work with his arm and his feet. He will have one touchdown running and another two throwing the football. Tennessee and Indianapolis will not have a 100 yard rusher. The Indianapolis line is porous and cannot block well enough for Frank Gore to get going. On the other side, the Titans rotate quick a few guys in their backfield, so not one particular guy will get the shot to crack the century mark. Oakland wide receiver Michael Crabtree had a great week against the Baltimore Ravens last week and I expect him to come out with a lot of confidence off that performance. But this week, that confidence will disappear. Cleveland will hold him under 100 yards receiving and he will not reach the endzone. Cleveland quarterback Jake McCown will not finish the game this week. McCown got cleared by the medical staff but if he slips up just once, the Browns should and probably will go to Johnny Manziel. The second-year pro was drafted in the first round. They may as well go ahead and let him play and see what they do or don’t have. The Raiders and the Browns will not total over 30 points. Both teams had a good week last week, but last week was an aberration. Both teams were not as good as they appeared last weekend. And this weekend will prove that thought correct. Cincy wide receiver AJ Green will have 125 yards receiving and one touchdown. As bad as the Ravens secondary was last weekend versus the Raiders, they will be lucky if he only scores one touchdown against them. Baltimore running back Justin Forsett will get on track this week. Look for him to go for 115 yards and two touchdowns as the Ravens offensive line gets it in gear. Cincinnati quarterback Andy Dalton will end this game with 2 interceptions. And in Andy Dalton fashion, one of them will be one that will have you scratching your head. New England quarterback Tom Brady has been on fire all season long. And in this game, he will continue his torrid pace. He will throw for 5 touchdowns against Jacksonville and systematically break them down while crushing their will. Jacksonville running back TJ Yeldon has been solid running the football. This week he has his breakthrough. He will have over 100 yards rushing and he will have at least one touchdown. Welcome TJ Yeldon to the masses folks. Patriots’ tight end Rob Gronkowski and wide receiver Julian Edelman are both known for being the go-to guys for Tom Brady. But this week it will be running back Dion Lewis. He will do damage to the Jacksonville in the running and passing game. He will amass at least 110 total yards and one touchdown. New Orleans quarterback Drew Brees will play, but he may not finish the game at all. The Panthers defense is the wrong defense to come in injured against. And speaking of injured, Luke Kuechly will be back this week reportedly. That does not spell good news for Brees and the Saints. Look for him to throw at least one interception before exiting the game. The Carolina Panthers will have a 100 yard receiver in this game. The team has not had the best track record at wide receiver since Steve Smith left, but the Saints are the perfect remedy for a receiving corps that has struggled. If I had to pick one wide receiver that will stand out, it should be Corey Brown. The Carolina Panthers will score more than 30 points. I know that might not sound like much for other teams, but the Panthers are a traditionally low-scoring team, so this is an offensive outburst for them. If he plays, DeMarco Murray will get at least 30 yards rushing. Some may be laughing at that one but you would not be laughing if you see the total amount of yards he has on the season. He has less than 20 yards on the season so far. 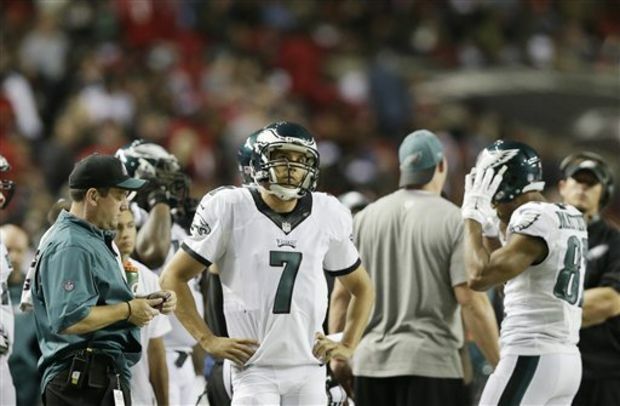 The New York defense will get at least two interceptions off Philadelphia quarterback Sam Bradford this weekend. The veteran quarterback from Oklahoma had trouble finding the green uniforms last weekend, so this week he will find the green uniforms. The problem is it will be the uniforms of the New York Jets. New York wide receiver Brandon Marshall will have 100 yards receiving and 2 touchdowns. The Eagles made some changes in their secondary prior to the season, but they have yet to pay off. And this week free-agent signee Byron Maxwell matches up with Marshall. This one could get ugly for Maxwell provided Jets quarterback Ryan Fitzpatrick can be accurate. Jameis Winston will follow up a solid second game with another solid performance. He will not throw an interception and he will account for three touchdowns (one on the ground and two in the air) versus the Texans. Houston Texans quarterback Ryan Mallett will connect for over 300 yards and three touchdowns versus the Bucs. Even though the Bucs won last weekend, their secondary is still suspect. And Mallett has an arm on him. If he is able to be accurate with that arm, then that could spell trouble for Tampa Bay. Houston defensive lineman Jadeveon Clowney will get two sacks in this game. The Bucs do not have a great offensive line. Most of their attention will be on JJ Watt, so expect Clowney to get some matchups that will favor him and also favor him getting to the quarterback. San Diego wide receiver Stevie Johnson has been good for the Chargers so far this season and I expect this game to continue that trend. He will be over 100 yards receiving and catch at least one touchdown pass. He and Phillip Rivers seem to be on the same page. Minnesota Vikings wide receiver Mike Wallace will go back to the Witness Protection Program this week. The speedy wide receiver the Vikings traded for this offseason will not even total 50 yards receiving in this game and will not sniff the endzone. San Diego Chargers outside linebacker Melvin Ingram will be wrecking shop this week versus the Vikings. Expect him to get at least two sacks while causing many issues for the Vikings. The St. Louis Rams have a fearsome front seven. Last week they were not as good as they were in Week One. Expect them to get back to the way they played against the Seahawks as they will collect at least four sacks and get back to their usual ways. Pittsburgh may give up some sacks, but the relief for that is having a running back to get some yards on the ground. Running back Le’Veon Bell will finally be back after his two-game suspension and he will be ready to show off a little. Expect at least 75 yards rushing and 55 yards receiving with at least one touchdown. The Pittsburgh Steelers secondary will go back to the way they showed up in Week One and the beneficiary will be St. Louis wide receiver Kenny Britt. The veteran wide receiver still has speed to get down the field and he will most definitely put pressure on the Steelers defense. Look for him to have 110 yards and two touchdowns. The Arizona Cardinals have scored 79 points in two games. They played against the Chicago Bears and the New Orleans Saints, two of the worst defenses in the NFL right now. The 49ers defense may not be as bad as the Saints and Bears, but their secondary got torched last week. Expect them to continue the execution against an unproven secondary. They will put up at least 30 points against the 49ers this weekend. But not to be left out, Colin Kaepernick finally hooked up with free-agent acquisition Torrey Smith for a big play last weekend against the Steelers. Look for these two to pick up where they left off with another big-time play for a touchdown as Smith will have over 100 yards receiving and a touchdown. The defenses of Arizona and San Francisco will combine for five sacks this weekend. The 49ers have had offensive line issues and the Cardinals may have some issues as well. Combine those bits of information along with the division familiarity and there may be some big hits on the quarterbacks. The Tyrod Taylor show will continue on for Buffalo. Expect him to run for a touchdown and throw for two as he is cool, calm and collective in the pocket and smooth outside of it. He will throw for at least 220 yards. Miami quarterback Ryan Tannehill will throw two touchdowns, but he will also throw at least two interceptions. Tannehill is solid, but the Buffalo Bills have some frustration to workout and Tannehill just seems to be the one in line for the release of their frustration. Ndamukong Suh will have at least one sack in this game. There has been talk that Suh is going rogue up front in the games. Well, whether he goes rogue or not, he will cause some havoc on Buffalo’s offensive line. Jay Cutler is out this week for the Bears, so Jimmy Clausen steps in to take over the offense of the Bears. And this is just what the Seahawks needed to see. He will throw at least three interceptions in his start and continue the offensive misery for the Chicago Bears. The Seattle Seahawks got the leader of their secondary back this week in safety Kam Chancellor. And they shall celebrate this week by not only getting three interceptions but also three sacks. The Bears are not looking good and the Seahawks are thirsty for a win. That is a bad thing for Chicago this week. Seattle running back Marshawn Lynch will have at least 100 yards rushing and touchdown. His offensive line may not be as strong as he once was, but they don’t call Lynch Beast Mode for nothing. He will drag, carry and pull defenders into the endzone and up and down the field. Denver running back CJ Anderson will go out and get 100 yards rushing. It seems the Lions have lost their bite defensively and Anderson has not been able to get on track at all. But this game is one that Anderson gets some good runs and gets back on track. Denver quarterback Peyton Manning will throw for 250 yards and two touchdowns. Manning will continue to get his yards, but the offense has definitely changed. He is still Peyton Manning, but he is not the Peyton Manning of old. Detroit wide receiver Calvin Johnson will not go over 100 yards receiving this game. The Lions have been in a funk the entire season and this game on national television will show just how far they have fallen so fast. 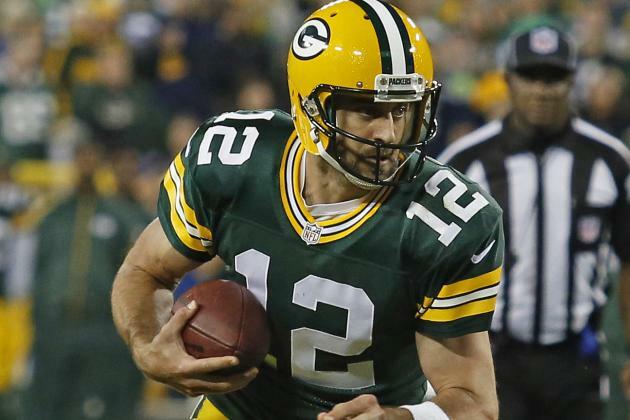 Green Bay quarterback Aaron Rodgers will throw for two touchdowns and 300 yards against the Kansas City Chiefs. The Chiefs are still reeling from the loss to the hands of the Broncos last Thursday. Unfortunately for them, they go from Peyton Manning to Aaron Rodgers. Kansas City quarterback Alex Smith was not so good last week versus the Broncos. Expect him to come out this week with a better game. He will finally throw a touchdown to a receiver (more than likely Jeremy Maclin) and he will throw for 225 yards. And he will not have any interceptions. The defenses in this game will combine for six sacks. The Green Bay defense will cause some issues for the Kansas City offensive line to the tune of four sacks while Justin Houston will get at least one sack and the Chiefs will get two total. Week Three is upon us ladies and gentlemen. Enjoy the game and enjoy the proclamations becoming reality. 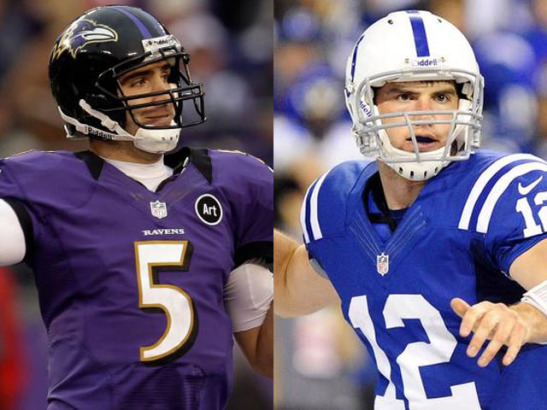 Indianapolis Or Baltimore: Which 0-2 AFC Team Can Make The Playoffs? The Indianapolis Colts and the Baltimore Ravens are two teams that many pegged as playoff teams before the season. The Colts went out and added veterans Frank Gore at running back and Andre Johnson at wide receiver this offseason. And defensively, they signed Trent Cole at outside linebacker to help their defense. And as far as the Ravens, they brought back the same offensive line and defensively were set like they were last season. The expectation was that Colts quarterback Andrew Luck would continue to drive this team right out of the blocks and they would come out with a purpose. For the Ravens, the veteran savvy of their team was expected to show in their resolve and will to win. So far, both teams have not been able to get into the win column, coming out of the blocks at 0-2. Both now stare into long odds to make the playoffs as the percentages are not in their favor. But anything is possible with these two. They both can and have made the playoffs with difficult circumstances around them. But which one has the better shot this season? The Colts have truly stumbled out of the blocks this season. They were largely uninspiring in their loss to the Buffalo Bills, getting manhandled on both sides of the ball. And in the Monday Night Football game against the New York Jets, the team looked like they could never get on track despite the Jets not exactly running away from them. Going forward, the Colts have a few issues to resolve. The first one has to be holding on to the football. The first person that is responsible the most for protecting the football is quarterback Andrew Luck. The former Stanford quarterback was ordained as the next great quarterback in the NFL, but he has looked far from that so far this years. So far this season, he has thrown three touchdowns and accumulated five interceptions. And to top that off, he has a career-low QBR of 28.5. That was not to be expected of Luck coming into this season. For him, he has to value the football more and use the weapons around him. But is not the only guy that has disappeared for this team. Former All-Pro Andre Johnson was brought in to be a dynamic player for the Colts this season. So far, he has been missing in action, only accounting for seven receptions and 51 yards. The Colts need him to be the force that he had been for Houston for most of his career instead of the guy that looked like he was done last year in Houston. Johnson and Luck are good players and are expected to get it going eventually, but the biggest question mark offensively is the offensive line. Luck has been under siege every single year he has been the quarterback in Indianapolis and this year has not been any different. He can be seen standing in the pocket taking hits or ducking free defenders because his offensive line is missing assignments or flatout getting whipped up front. And when it comes to run blocking, the Colts are pretty soft up front. Frank Gore is running like he usually does, but it seems those holes he used to have are not there. Gore is not as quick to the hole, but where do you run when there is no hole to run thru? That falls on the offensive line. They need to get it together. Defensively, the Colts are holding up in their secondary pretty good. For a team that has not been healthy at corner, they are not doing terribly there. But where this team lacks strength is their pass rush. Trent Cole was brought in to help, but he has been invisible for the most part. Robert Mathis just came back this week versus the Jets, but he was also invisible. In order to help their depleted secondary, the Colts need to find a way to make it happen up front. If they don’t find a way to make it happen, then there is no way the Colts can run the man scheme they run in the secondary. And that means the Colts will have to adjust not only their scheme up front but their coverage schemes as well. And that could be something that is hard for them to do on the fly. But for all the bad things that are hampering the Colts, they have some good things that they can draw on from this experience. The Colts were in this same exact position last season. They were 0-2 and many wondered would they get it together. But little did we know that this team was getting ready to explode and make a run to the playoffs. Andrew Luck would recover from a shaky start to throw for 35 touchdowns and only 11 interceptions. And with him, receiver TY Hilton had his best year to date. So there is precedent for them to come out of this hole. One of the things that helped them last season come out of their hole was their division. The Houston Texans, Tennessee Titans and Jacksonville Jaguars have not exactly been the biggest deterrent to the Colts taking over their division. This year those teams appear to be better, but the Colts are still the more talented team of all of them. The Colts could be solid against all three and it is very possible they could only lose one to maybe two games against these divisional foes. That would be good enough to get them into the playoffs. And also, let’s take a look at their schedule outside of the division. The Colts have the NFC South to play against this season. The Panthers are solid and so are the Falcons, but both are teams that the Colts can beat this year. Add to that the Tampa Bay Buccaneers and the New Orleans Saints and the Colts could potentially only lose one game to this division. So as bad as it looks for them, the Colts are not as bad off as it seems right now. But of course this all depends on how they play going forward. The Baltimore Ravens have been known to be gritty and tough for the majority of their existence. They, like the Indianapolis Colts, are expected to compete for the AFC crown. They started off with a tough loss against the Denver Broncos on the road and then followed that up with a puzzling loss to the Oakland Raiders. The teams is now in a position they have rarely been in and will hope their leadership helps bring them out of it. But there are some issues they really have to address moving forward. For one, the Ravens are not able to run the ball consistently like they thought they were. Coming back into the season, the Ravens were thought to have a solid offensive line. The return of every single starter from last season along with leading rusher Justin Forsett gave many reasons to think the Ravens would have a dependable running game. Well, unfortunately it has not been that way so far. The Ravens are 21st in the league rushing this season and Forsett has not been as productive as last season. This is a direct result of not having anywhere to run. The line simply is not opening up the holes they did last season for the diminutive running back. And as a result, the Ravens are depending more on the passing game. The passing game in itself is something that needs some work for the Ravens as well. The team is depending on wide receiver Steve Smith to be the bellcow for them once again. And they were hoping to have rookie wide receiver Breshad Perriman and tight end Dennis Pitta to help him out. The bad news for the Ravens is Perriman and Pitta are not healthy and Smith has been out there on his own. That basically limits the Ravens passing game right there. And even though there are other players on the team, the Ravens need more weapons to make it happen. With the running game being limited, they need someone to step up outside of Smith badly. And for Smith, he has to quit dropping the catches that hit him in the hands. Smith has had cases of the dropsies before in his career, but he has to be even better with that right now because he is it in the passing game essentially. Defensively, the Ravens have one big issue that is not going away anytime soon. The Ravens have no pass rush. When Terrell Suggs went down with a torn Achilles, the pass rush left with him. The result is opposing quarterbacks now having all day to throw to their weapons. And that can be dangerous for a Ravens team that is solid but not strong without the pass rush. Going forward this season, the Ravens need someone to step up in that area to make it happen. Courtney Upshaw has a perfect opportunity to step into a starring role with the unfortunate injury to Suggs. But so far in his career, he has not shown the propensity to consistently rush the passer. And there are others that are unproven on this team that will be trying to fill Suggs’ role. And while they are doing so, the secondary will be working a little harder to try and keep it together. The doom and gloom is something that will not be around all the time in Baltimore. As bad as it looks for them, they still have a quarterback that is pretty capable of carrying them in stretches in Joe Flacco and a receiver that seems to thrive when things don’t look so good. But looking at their schedule, there may be some other things out there for them as well. The Ravens will eventually get Perriman back in their wide receiver corps. That will allow Smith some breathing space provided Perriman is as good as advertised. And hopefully with a boost in the passing game, that will allow for the running game to get itself on track. The schedule does not do the Ravens any favors at all. They play the tough NFC West and they also have to see the Steelers and Bengals a combined four times. Of course right now the schedule looks daunting along with the task, but the team will find a way to get some pressure on the quarterback. One of those weapons they will use is linebacker CJ Mosely. He was outstanding as a rookie and has been solid so far this season. Look for the Ravens to move him around with a lot of other pieces to cause some confusion for offenses. If they are able to create mismatches and issues for opposing offensive lines, their secondary will get some help and the defense will be better. And let’s not forget that they have to play Cleveland at least two more times this season. Another thing to notice on their schedule is they play the San Francisco 49ers this season when they play the NFC West. And over the years, the Ravens have had their number and that could potentially continue. The task does not look easy, but if anyone can come back from this one then it’s the Ravens. Both teams have tough tasks ahead of them. But if any team can do it, these two are capable. But the schedule and how they adapt to their situations will be critical for them. It will be interesting to see how they make it going forward and what adjustments they make to try to win. Baltimore has the tougher task and Indy has the tougher road. But the thing about the NFL: it is unpredictable. It will be interesting to see what happens going forward. Philadelphia Or Seattle: Who Can Recover From Their 0-2 Start To Make The Playoffs? The Philadelphia Eagles and the Seattle Seahawks were the two teams that were mentioned as playoff contenders. Philly with their brand new quarterback, wide receiver and cornerback were a team that many bought into as the one to take over the NFC East potentially. And with the Seattle Seahawks, they returned a lot of their pieces and added tight end Jimmy Graham via trade from the New Orleans Saints. But unfortunately for both teams, the season has not gone as they both thought through two games. The Eagles have been suspect offensively and cornerback Byron Maxwell has not been as advertised. As far as the Seahawks, they have been physically handled the first two games of the season by St. Louis and Green Bay. Both teams are in positions they have not been in the last couple of years. And amongst their fans and fans of the game, there have been some rumblings as to what is going on. There are some even asking can they make the playoffs. Both are heading into Week 3, but there is already trepidation in regards to the way things have gone so far. The percentages are really low for both teams to make the playoffs based on teams coming back from 0-2 starts to make the playoffs. But these teams are definitely talented enough to make it happen. But which one has the better chance of doing so? The Eagles are definitely being talked about a lot in the City of Brother Love. They thought this team would be 2-0 to start the year and not 0-2. But here they are and they have to come back from this shocking start to make a run to the playoffs. The troubling thing about this team is the way their offense is sputtering. The quarterback, Sam Bradford, just never seems to be on the same page as his wide receivers all the time. The result is passes that are thrown in the wrong spots and passes that look like they are thrown to no one but the other team. The result is four interceptions for Bradford, an ugly passing game and Chip Kelly not being able to run his pace on offense. Another issue offensively has been the offensive line. Last season they were sporadic at best, but this year they look really bad. The biggest issue is they let go of a Todd Herremans and Evan Mathis as their starting guards. Those two were solid when they were healthy and made LeSean McCoy look good last season. Now they are gone and Philly has gone with young guys that have not proven they can get it done at this point in the season. The result: a running game that looks awful. Free agent acquisition DeMarco Murray has not looked very good at all behind them, not even having 20 yards rushing on the season. For a guy that wanted all his own people there, Chip Kelly has to be disappointed in what his offense has produced so far. And for his sake, he better hope they get it together as the season goes along. But even with how bad the offense has been, the defense showed some strides from game one to game two. In the first game, the Eagles were getting lit up by wide receiver Julio Jones. Byron Maxwell was getting burnt early and often by Jones and veteran wide receiver Roddy White. He got burnt a few times today, most notably on a slant to seal the game by wide receiver Terrance Williams. But he did actually make a play today on the defensive side. He forced a fumble that put Philly in great position to score (although they did not score at all). The front seven of the Eagles will be the strength of this defense. They played well today, but eventually they ran out of gas up front. Sadly, their effort went in vain. But the Eagles can hang their hat on their defense despite what they offense is doing. And that is something they can build on. The Eagles have been ugly so far, but there is some hope there for them. The good thing is there is 14 games. The Cowboys are leading the division but they will be without wide receiver Dez Bryant (foot injury) and quarterback Tony Romo (broken clavicle) for an extended amount of time. Those injuries to Dallas’ bigtime players will cause them to lose some games this season that they may not normally lose. And if the Eagles can start getting it together, then they will be able to make up some ground. The other team the Eagles are looking up to in their division is the Washington Redskins. Although they won today, there is always the thought that the circus there could cause issues at anytime. Kirk Cousins played well as the starting quarterback today, but he could easily go back to the way he played against the Miami Dolphins. Both of those teams are vulnerable and can allow the Eagles to catch up. The Eagles also have to face the Giants in this division, who so happen to be having their own set of issues closing out games. So essentially, the Eagles have a chance due to the things going on around him. The division and its setup allows for all hope to not be lost. The Seattle Seahawks are fresh off their second loss of the year and they did not look particularly good in losing. The team seems to be trying to sort through things as they go along. Sometimes you can win while doing so, but they cannot do so. Like the Eagles, one of their biggest issues is their offensive line. They are not as solid in run blocking and they also have had issues keeping Russell Wilson upright and giving him time to pass the football. The result has been an inconsistent offense led by a quarterback that is starting to hear footsteps that make him leave the pocket a little sooner than he really needs to sometimes. And the other thing that has happened is the nasty physical edge the team had up front has been lost, causing Marshawn Lynch to have to make plays on his own. Lynch is talented and one of the best players in the NFL at making yards after contract, but that is asking a lot of him to do that every single play. Defensively, it seems like the team is not the same in the secondary. They are still talented and good back there, but their leader is missing and that is hurting them. Safety Kam Chancellor is out right now as he and the team are in a contract dispute. The dispute stems from Chancellor wanting the money on the end of his contract brought up a year or so. The team refuses to do so and that left Chancellor the option of negotiating while being away from the team. Some call that selfish, but what if the team was to cut him or try to renegotiate with him so he does not get that money? Selfish or not, Chancellor is not in camp and the secondary is missing him. The biggest thing they miss from him is the communication. Some think that Earl Thomas is the communication guy, but that guy is Chancellor. He always makes sure to get everyone in the right position and also brings an edge to their defense. Seattle is still a good secondary and a good defense, but they are not lights out without Chancellor. The good thing for the Seahawks is they played better than they did the first week versus St. Louis. The defense had it together a little bit more and the offense got it going more on the ground than they had before. But in terms of making the playoffs, the division will be tough on them. The Cardinals are a tough team and the Seahawks have definitely experienced the Rams already in St. Louis. And even though the 49ers are not the same team, they are still a team that Seattle has to take seriously due to the nature of the rivalry that has been there. But on the bright side for Seattle, they have faced their toughest opponent in the NFC North. They still get to see the Detroit Lions, Minnesota Vikings and Chicago Bears, which are very winnable games seeing how back all of them are. Add in they are facing the Dallas Cowboys in Week 8 potentially without Dez Bryant and Tony Romo and facing the Cleveland Browns in Week 15 and the Seahawks have some games that should allow them to be right there in their conference. The good thing as well is that their division is one that is tough. That works to their favor because anyone can beat anyone at any given time. If they can handle their business in the division, then they will surely get some unexpected help in the division. The Seahawks have one of the best quarterbacks in the NFL and they will surely get all or most of their issues on both sides of the ball worked out. But the question remains will they get all things worked out in time. And another question that remains is will Kam Chancellor be there to be a part of them turning it around? It should be interesting to see if they can pull it together to make another run at a title. Both Seattle and Philadelphia have uphill battles going forward. But along with all the doom and gloom so far, they both also have some things that go in their favor. It will be interesting to see the adjustments and how they do going forward. And it will be great to see which team gets it together enough to make it to the playoffs and cause some problems. The Philadelphia Eagles were a team to watch to start the 2015 NFL season. After a couple of ten win seasons, Chip Kelly decided to make some changes to his team. He decided to either trade, cut or let go running back LeSean “Shady” McCoy, quarterback Nick Foles, offensive lineman Evan Mathis, wide receiver Jeremy Maclin and others and replaced them with either someone younger pieces or players that he felt fit what he wanted to do. A few of those players he brought in were quarterback Sam Bradford (traded Nick Foles to St. Louis in order to obtain him) running back DeMarco Murray from the Dallas Cowboys and defensive back Byron Maxwell from the Seattle Seahawks. Those additions along with the buzz around Chip Kelly and his relationship with his former players put the attention squarely on this team. Would the Eagles come out and wreck shop or would they come out and not justify the hype? After one game, it looks like the Eagles did not meet the hype. Bradford was lackadaisical in the first half. He began to get it going in the second half and ended the night throwing for 336 yards, one touchdown and two interceptions. As far as Murray, his debut did not go as well as he would have wanted. He ended up scoring two touchdowns (one rushing and one receiving), but the nine yards on eight carries was something that even he had to be shocked by. But what may have shocked some was the performance of Maxwell. He was going against one of the top receivers in the NFL, Julio Jones. But with that being said, he was signed to be the top corner for this team and main deterrent to top receivers. Instead, he was taken advantage of numerous time by Julio Jones along with veteran wide receiver Roddy White. He had some bright moments, but the play of Maxwell was not what some fans expected of him. The Eagles would go on to lose the game to the Falcons in Atlanta and it definitely surprised some people. All of sudden, the Eagles went from being the most talked about to potentially being one of the most desperate teams out there. And heading into Week 2, one of their biggest rivals comes to town. The Dallas Cowboys are riding some momentum after their thrilling victory against the New York Giants. And if they are able to come into Philadelphia and beat the Eagles, that will give them the upper hand on both the Eagles and the Giants to start the season. So with that being said, there is a level of pressure on the Eagles already this season. The Eagles have a level of expectation that was created by Chip Kelly. He has reinvigorated the fanbase with his refreshing style of play and he also has some Eagles fans believing that he will take them to a title. Whether that is true or not lies in the heads of those fans and the actions of the team. But what can be said is true is the fact that teams that fall to 0-2 to start the season don’t make the playoffs much. There have been some that have bucked the trend, most notably the New York Giants when they defeated the New England Patriots in the Super Bowl during their undefeated season. But the reality is only 13.75% of teams make it to the playoffs after starting 0-2. For the Eagles, they don’t want to add more pressure than they have to, so Sunday is almost a must-win for them if they plan on making the playoffs. They must learn from the game in Atlanta last week and come out with a sense of urgency from the beginning of the game. It was evident that the Eagles offense came out in a malaise last week and that is something that cannot happen for them. DeMarco Murray has probably looked back at his first game as an Eagle and is chomping at the bit to get back out there. But what makes the game even sweeter for him is that he is going against a team that used to employ him. If that does not fire him up and make him run even harder, then I don’t know what will. And if he comes out and runs like he can, then the rest of the Eagles offense will follow and things will come easier for them. That will also make Bradford more comfortable as well, and open up the field for him to take advantage of the playmakers he has at the receiver and tight end positions. Another thing to take a look at is the performance of the defensive backs. They caught a break in regards to not facing Dez Bryant due to injury. But that does not mean the job gets easier. The Cowboys will still be making some plays in the air with quarterback Tony Romo and he can make you look silly at times as a defensive back. Byron Maxwell may want to pay attention this week and he also may want to atone for the first regular season game he had in Atlanta for the Eagles. If he comes out and plays like they paid him to, the Eagles secondary will be better and the confidence will permeate throughout the team. And with the big guys they have up front, this team could cause some problems and make some things happen. The Eagles surely have some questions to answer in this game and there are some for Dallas to answer as well. But there is no doubt that this team wants to atone for the performance in Week One. And unlike the first game, the pressure has picked up. The question is will they respond or have to fight that uphill battle to make the playoffs after an 0-2 start? We shall know the answer Sunday night. The college football season is a few weeks in and everyone is starting to look towards who are the teams that will make it to the playoffs. Along with looking at that picture, many are taking a peek at the stars of college football. Guys like USC’s Cody Kessler and TCU’s Trevone Boykin were the names that many spoke of when it came to the next Heisman trophy winner. But like every season, there is someone that comes out of nowhere. A couple years ago it was redshirt freshman Jameis Winston from Florida State that came out of nowhere to win the Heisman. And along with winning the Heisman, he took his team all the way to the National Title. Before Winston, there was also another redshirt freshman that won college football’s most prestigious award. Texas A&M’s Johnny Manziel was magical in his first year in college football. The Texas high school legend took over the college football world as he took on all challenges and electrified the sports world. His most signature moment was against the Alabama Crimson Tide, when he took his team into Bryant-Denny Stadium and beat the top-ranked team in the nation. Well this year’s darkhorse may not be a freshman, but he is definitely taking advantage of having the stage almost all to himself. He has been talked about ever since he committed to LSU and many wondered when he would have his potential Heisman moment. Well, it did not come as quickly as some thought. Leonard Fournette arrived at LSU with much hype. The 6’1”, 230 pound running back from New Orleans, Louisiana was wanted by ever major program in the county and chose to go to LSU. And immediately, the thoughts of what he could do began to rumble throughout college football and the Southeastern Conference. Well, at the beginning things were slow for him. Fournette was playing for a coach that believed in rotating running backs. In his first year, he was not clearly the lead guy in the pack. Senior running backs Terrence Magee and Kenny Hilliard were the main players along with Fournette. The freshman running back would end up getting the most carries and yards of any of the three, but he also had to split a ton of carries with those three. As a result, it seemed like Fournette would never get in a rotation that allowed him to fully become engaged in the game. He would end up rushing for 1,034 yards, but there was much more expected of him. Going into his sophomore season, it seems as if they have made it a priority to make Fournette the lead dog in the pack. Fournette has the most carries of all the running backs this season so far and there is no one even close to where he is. And for the season so far, Fournette has four straight 100 yard rushing games. And he topped it off with the performance he had this past Saturday against the Auburn Tigers. 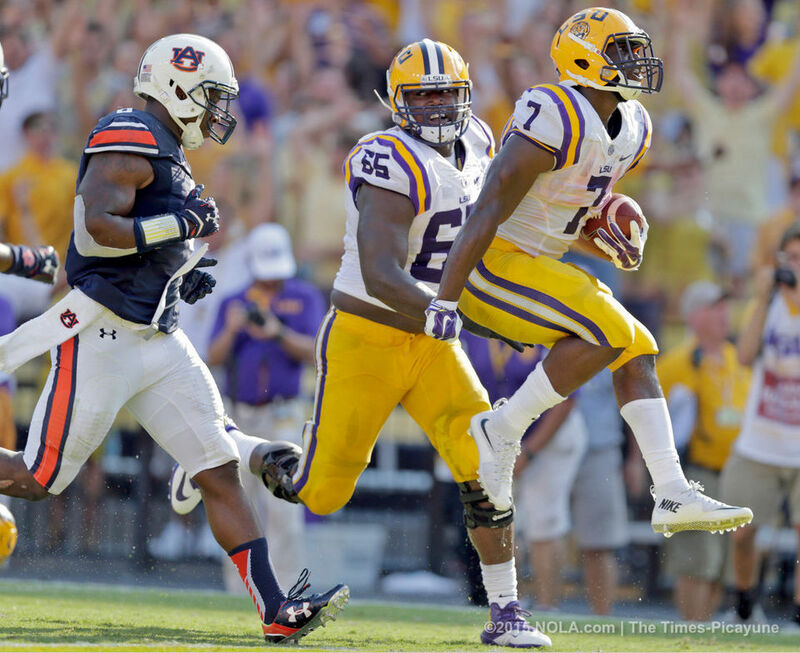 It seemed like all week the Auburn Tigers were talking to Leonard Fournette. They were speaking carelessly about him to the media like he was just some nobody that could do nothing about it. Fournette did not say much about the talk from Auburn, but he let his actions speak for him. The big back with jets came out focused and he can definitely thank Auburn for lighting an even brighter fire up under him. He ran over, around and through the Auburn defense to the tune of 228 yards and three touchdowns. Fournette was a one-man wrecking crew. And with that performance, Fournette now has made his mark and struck a chord in the national media. To be a man of his size and have some of the quickness he has along with the speed he possesses is truly a gift he was given. The moment has finally come for him and now he has officially entered the Heisman race. And looking at the landscape, he actually does have a chance to win the award. Kessler and the USC Trojans lost to the Stanford Cardinal on Saturday night, so that brought his star down some. And TCU quarterback Trevone Boykin has been erratic all season long. That alone has him getting a look from some right there. But with the performance today, he definitely has vaulted to the top of the list. Fournette is a monster at running back and he definitely handed it to the Auburn Tigers. But going forward, he is going to have to have strong performances every single week. A 200+ yard performance may be asking a lot every week, but at least he has to get 125-150 a game and one or two touchdowns for him to have a chance at the Heisman Trophy this year. The National Title is something that he probably wants more than the Heisman Trophy, but if he is able to carry this team like he has so far, then he could put himself in position to make both happen in one season. And that right there is what makes players like Fournette legends.